On these chilly Autumn days, we’re taking every chance we can get to indulge in hearty, warming dishes that feed the soul. 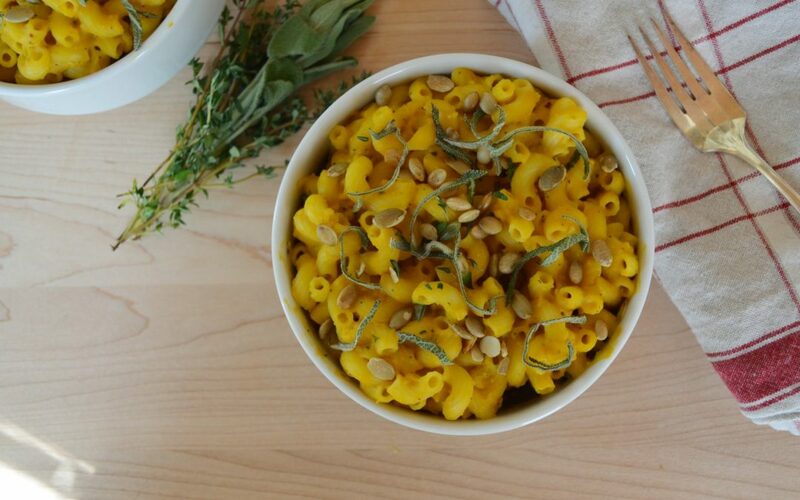 One of our favorites is our classic Creamy Herb Pumpkin Pasta Sauce. Best of all, it’s gluten-free, vegan, and still simply delicious! This recipe is a perfect side for any holiday gathering, or as an indulgent treat for one! Melt the oil in a saucepan. Add onions and herbs until fragrant and onions are translucent. Add the garlic, and sauté for another minute. Remove from heat, and add to a food processor along with the pumpkin, arrowroot starch, vegetable broth, almond milk, salt, nutritional yeast, cashews, and red pepper flakes. Pulse until completely combined. Taste for seasoning, and adjust as needed. Return to pan and bring to a simmer on low heat. Make the pasta according to package instructions, and drain. Toss drained pasta with sauce and serve immediately. Garnish with pumpkin seeds and fresh, chopped sage.